Tasmania’s east coast is the driest part of the state, getting around 600mm of annual rainfall, while the national parks on the west coast drip with 2,400mm. The wine-growing region is about 180km from the vineyards of the north around Launceston. And it’s about the same again from the east coast to Hobart in the south. Vineyards overlook the Tasman Sea and the Freycinet National Park, where the stark and rocky granitic Hazards burnish orange as the sun strikes them just right. As well as being the driest part of the state, the east coast is one of the warmest bits of Tasmania, though with localised differences. Irrigation can be necessary here, indeed Coombend Estate have a reservoir that has enough water to buffer them against two to three years of drought. 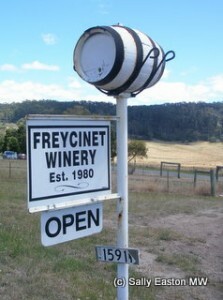 Freycinet Vineyard (Wine Glass Bay on export markets) is the pioneer producer on the east coast. The property was bought in 1978 by Claudio Radenti’s in-laws, and planted in 1980. Radenti, who has been running the business with partner Lindy Bull since 1993, explained “there is milder weather on the east coast. We’re in a sheltered valley on the slope so we have more sunshine and extra warmth.” He emphasised the importance of site selection in Tasmania, saying the proximity to close-by Moulting Lagoon helped to moderate the temperature. These factors put vine physiology on the east coast ahead of that in the south. Radenti even has a bit of cabernet sauvignon planted among his more reputed pinot noir. It is for wines from chardonnay and riesling as well as pinot noir that the east coast is building its reputation. Radenti said “in 1988 we started to raise a few eyebrows with out pinot noir” which he plants on a north-facing slope for warmth. Freycinet also have a bit of shelter from the prevailing westerlies, which is a bonus for Radenti. “Our neighbours have windbreaks” he said. His neighbour is Coombend Estate. 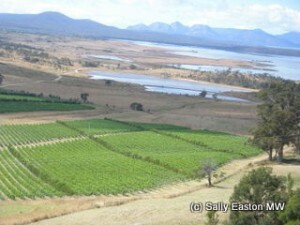 In the 1990s, the then owners planted a small vineyard next to Freycinet. Things have changed since then. In the mid 2000s new owners Gunn’s expanded the vineyard all the way down to Moulting Lagoon game reserve, directly overlooking the Hazards. Now the vineyard is part of Brown Brothers’ Tasmanian Estates. It is the biggest single vineyard in Tasmania. At 184 hectares, and seven kilometres long, it represents 13% of the entire Tasmanian vineyard area. Fruit is used for the domestic Coombend label and for Devil’s Corner, where pinot noir for reserve and estate wines is grown on the top of the warm, north-facing slope. This is where, a bit higher up and a bit further inland, a small cluster of vineyards has developed out of mixed and sheep farms. Springvale put in a vineyard about 15 years ago, and Milton Vineyard followed a few years later. Gala Estate is more recent still, where spray water systems have been set up to protect against frost. This, and more, makes the east coast a diverse vineyard region. It stretches from north of noted pinot noir producer Aspley Gorge, near Bicheno, to the far south-eastern corner of the island, which might have more in common with vineyard regions around Hobart. At least no-one is suggesting any of the island’s embryonic wine regions are written in stone. Great article but it seems such a shame that you did not publish any tasting notes.